This app computes the times the eclipse phases are visible at a given location. This software computes times for partial and total eclipse phases. Outside the path (and time) of totality, view the eclipse using solar filters or solar projection. If you are unsure when and where it is safe to view the eclipse, ask for help. Four phases describe a total eclipse: first through fourth contacts. The map views mark the northern and southern limits of the path of totality. 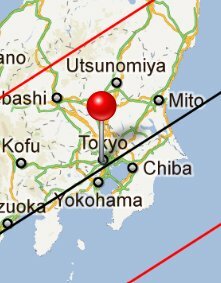 Only in this area can one experience a total solar eclipse, beginning at the moment of second contact and ending at third contact. The centerline is shown for central eclipses, namely those which have non-partial phases (annular, hybrid, and total eclipses). First contact occurs when the moon begins to obscure the sun. This marks the start of the partial phase of the eclipse. When viewing the eclipse outside the path of totality, the moon will gradually cover more of the sun’s face, and then reverse the process. The sky will remain blue; without special viewing filters, a partial eclipse may go unnoticed. In this case, the times for second and third contact are not shown. Instead of the eclipse duration, a percentage is shown. This is the maximum percentage of the sun’s surface that is covered at the middle of the eclipse (halfway between first and fourth contact). With annular eclipses, the entire eclipse must be observed with the same precautions taken for partial eclipses. The light on the ground will appear muted, and the sky remains blue. Hybrid eclipses will appear either as annular or total eclipses depending where the observer is. For eclipse viewers inside the path of totality, the partial phase appears as it does for everyone else. But just before totality, the sun peeking through the lunar valleys gives rise to the phenomena of Baily’s Beads, and a spectacular diamond ring effect. After second contact the moon maximally obscures the sun. 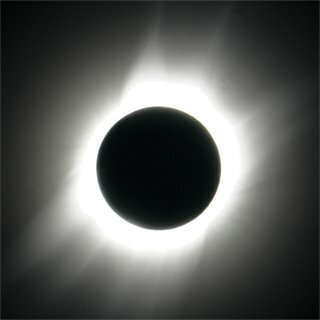 For total eclipses, the solar corona is visible, and provides roughly the same illumination on the ground as a full moon. The corona changes from eclipse to eclipse. Until the launch of the Solar and Heliospheric Observatory (SOHO), the only time the corona was visible was during a total solar eclipse. Just after third contact, a second diamond ring occurs as the moon eases away from totality. Finally, the end of the eclipse is known as fourth contact.